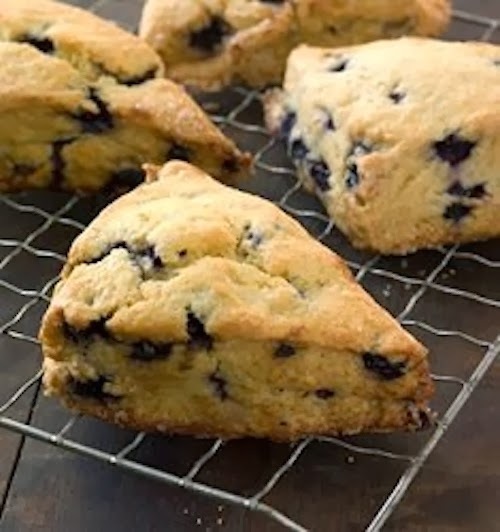 Here is your basic "start here" gluten free scone recipe. While this simple vanilla scone is delicious as is, it's also the perfect vehicle for your favorite add-ins. I have chosen to add in fresh blueberries but feel free to use frozen if that is what is available or any number of other add-ins. Some suggestions are dried cherries, crystallized ginger, chocolate chips, dried cranberries, walnuts and pecans, just to name a few. These scones are great for breakfast or anytime! 2 3/4 cups Gluten Free All Purpose Flour, plus a little extra for dusting the work surface See notes below on gluten free all purpose flour/baking flour options. 2 large eggs Note: An easy egg substitute, if desired, is 1 tablespoon flax seed meal mixed with 3 tablespoons of warm water per egg. 1 teaspoon xanthan gum Note: See note below on gluten free flour mixes regarding this. 1 1/2 cups of fresh or frozen blueberries Note: If you use frozen blueberries completely defrost and make sure they are well drained. In a large mixing bowl, whisk together the flour, sugar, salt, xanthan gum, baking powder and baking soda. Cut in the Earth Balance just until the mixture is unevenly crumbly; it is okay for some large chunks of the butter spread to remain. In a separate mixing bowl, whisk together the eggs (or egg replacement), vanilla and coconut yogurt. Add the liquid ingredients to the dry ingredients and stir until moistened and holds together. Turn dough out onto the parchment lined baking sheet and dust the surface with a little flour. Divide the dough in half and round each half into a 5 inch circle, 3/4 inches thick. Using a large knife that you have run under cold water, slice each circle into 6 wedges. Carefully pull the wedges away from the center to separate a bit; creating about 1/2 inch space between them. Bake the scones for 20 to 25 minutes, or until golden brown. Cool briefly and serve warm. Wrap in plastic and store at room temperature for up to several days. Let everyone know by posting in the comment section below what your favorite add- ins are. If you want a healthier option that provides more protein, fiber and nutrients go for Bob’s Red Mill. If you want a lighter flour more like white flour go with any of the other ones. Would you consider making a video and uploading it here or on Youtube? That'd be really helpful. Thanks for your great suggestion! I have never done anything like that and am not even sure how to do it, but I will DEFINITELY give it some consideration. Thanks for visiting my blog.